Nursing is increasingly becoming as “high tech” as it is a “high touch” profession. Today’s nurses have more technology at their disposal than any nurses ever before, and as one might expect, it’s considerably improving patient care. One area where nurses are putting technology to use is in informatics. Officially known as the study of information, in the world of health care, health informatics is the management of health information. Using electronic medical records, devices that collect health information electronically, and other electronic information standards, health informatics nurses are responsible for managing, interpreting, and communicating the data that comes in and out of health care facilities, all with one primary purpose: Improving the quality of patient care. But how does that happen, specifically? How are nurses using informatics as a way to improve the care they — and their colleagues — provide to patients? As it turns out, there are several key ways that informatics is part of that effort. Documentation has long been considered an important part of the nursing profession, but it’s more vital than ever to the delivery of quality care. 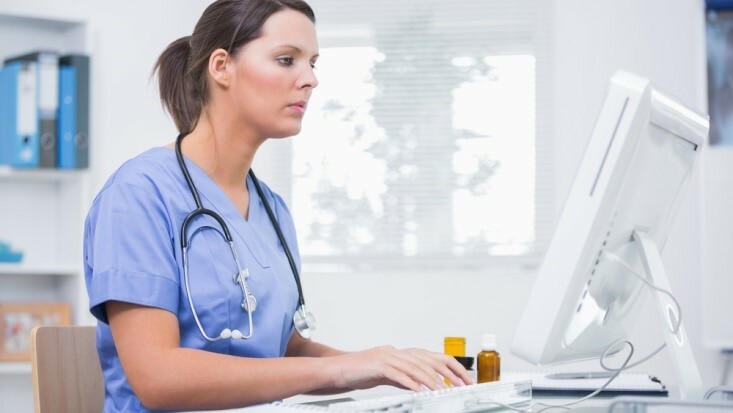 While the theory and practice of nursing, the standards of nursing practice, legal and ethical considerations, and other points that are taught in advanced nursing programs all influence the practice of nursing, it’s information, and specifically, electronic documentation, that is having the greatest influence on modern nursing. Modern nursing care is driven by individual patient needs and history — information that is collected and organized in electronic patient records. By documenting a patient’s condition, and sharing that information electronically, nurses are able to more effectively manage care, and by extension, improve the quality of that care. A great deal of documentation takes place automatically thanks to connected devices, which collect specific information in real time and transmit it to patient records. By looking at the documentation of a patient’s condition over time, nurses can make better decisions about how to provide care and when changes or adjustments need to be made. Patient safety is a primary concern of any health care provider, and nurses are often on the front lines of ensuring that their patients are kept safe and preventing medication errors, misdiagnoses, falls, and other problems. Health informatics provides important data that can prevent these errors; for example, an electronic record can provide information about a possible dangerous medication interaction or allergy that might not otherwise be immediately apparent. Armed with data, nurses can make quick decisions that keep their patients safe. In fact, in a study by the Agency for Healthcare Research and Quality (AHRQ), a majority of nurses reported that when they have access to EHRs, they have fewer problems with getting patients ready for discharge, fewer medication errors, and better quality of care. And when it comes to transfers between departments, nearly 15 percent of the nurses surveyed reported that information was more likely to be shared and less likely to “fall between the cracks” when electronic systems are used. Medical errors cost nearly $40 billion every year, and many of those errors are preventable with informatics. Not only does information provide nurses with alerts to avoid errors, it also helps to automate certain tasks, both improving nurse productivity and preventing some of the costs associated with health care. Nurses are often called upon to help coordinate the care of their patients. This often means relaying information from physicians, therapists, pharmacy, billing, and more, both during care and at discharge. Without all of the necessary information, patient care could suffer. Informatics improves the coordination of this information, allowing nurses to give their patients all of the information they need, improving both outcomes and the satisfaction with care. While there are some who criticize the use of informatics and technology to help manage care, arguing that it makes health care more impersonal, with the provider-patient relationship being replaced with data and algorithms, there is actually overwhelming evidence that informatics actually improves care. Nurses who are trained in this technology and how to best incorporate data into their workflow are often more productive and able to provide better care than ever before. very informative post, I am looking for home care nursing courses, I would like to specialize in health care and everydayhealth. Is there a link to the study mentioned in the article? No idea. I was also looking for that !